Highway 99 tunnel excavation is halted while damage to a Port of Seattle dock is inspected. The recently repaired tunnel-boring machine Bertha stopped digging early Tuesday, after a barge tilted, damaged a dock and spilled excavated dirt into Elliott Bay. 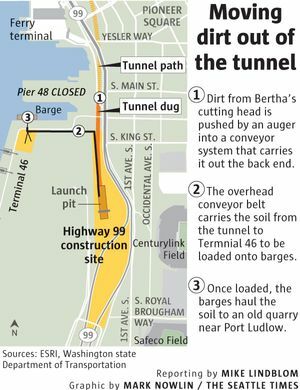 Divers and marine surveyors were inspecting damage to the dock at the Port of Seattle’s Terminal 46, where the tunnel project’s conveyor system pours soil dug out by Bertha onto outgoing barges, state officials said. Without a place to deposit the dirt, Bertha is stuck, until the Seattle Tunnel Partners (STP) construction team can moor a replacement barge or make other arrangements. 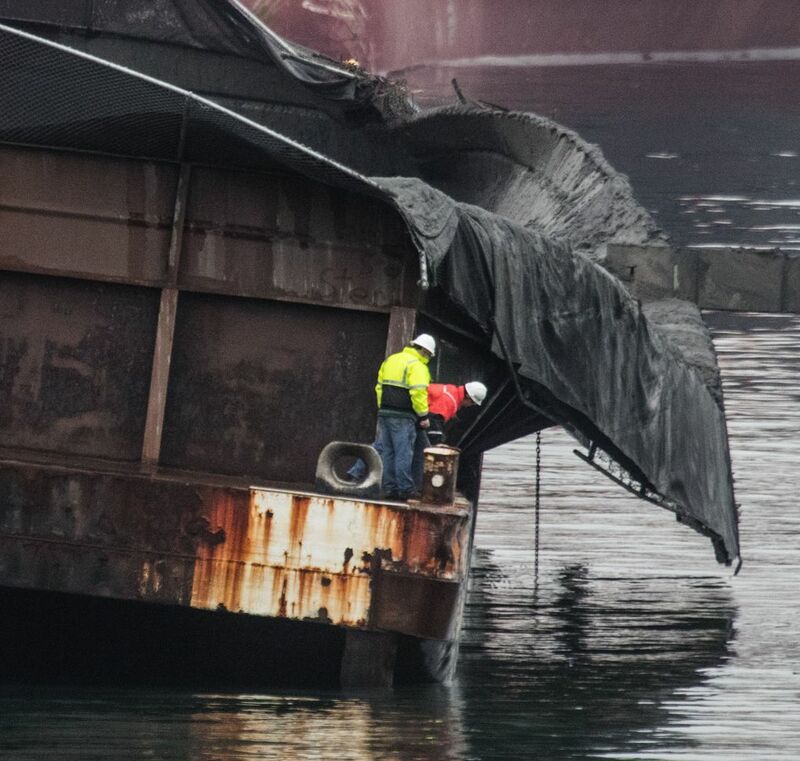 “Crews are assessing what needs to be done to safely stage a barge at Terminal 46 for loading,” according to the Washington State Department of Transportation (WSDOT). STP told the state that tunnel boring should resume some time this week, said WSDOT spokeswoman Laura Newborn. “STP did not expect it to be a long-term delay,” she said. The cause is under investigation by STP, Newborn said. A number of possibilities exist. 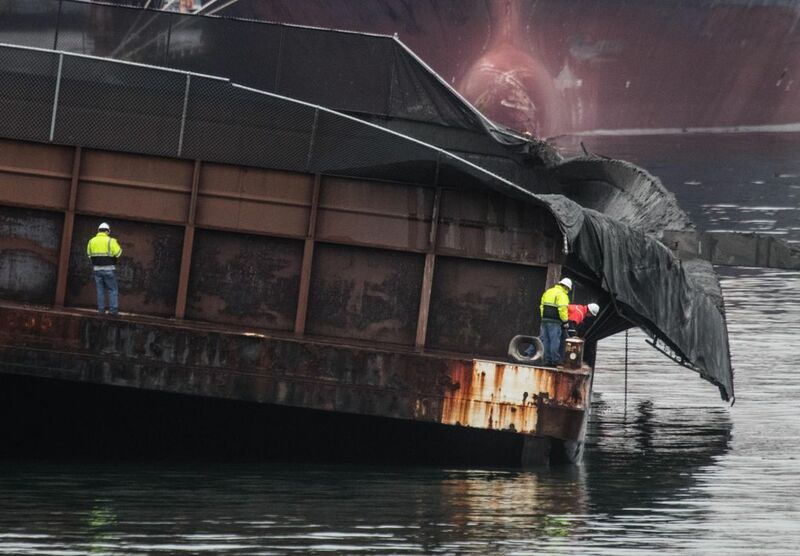 Perhaps the soil was loaded too quickly; the barge wasn’t repositioned correctly while dirt was poured onto it; or mechanical problems were to blame. The episode represents the latest hitch in the long-delayed effort to build a four-lane, tolled Highway 99 tunnel, which was supposed to open to traffic last month. Bertha made its way out of a concrete-lined repair vault last week, after a breakdown two years ago and significant repairs. The latest schedule calls for the tunnel to open in April 2018. The barge, docked at Port of Seattle Terminal 46, began to list Tuesday as it was being loaded. 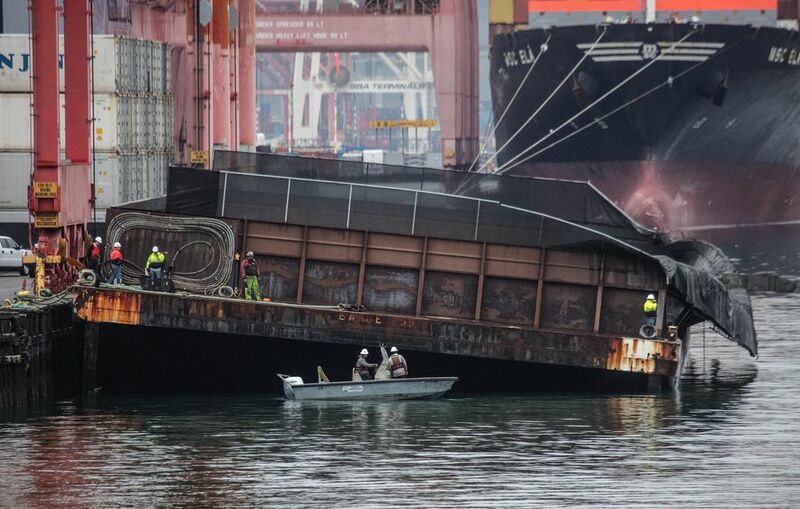 Workers released the barge from its mooring to prevent damage to Bertha’s conveyor equipment. The barge drifted to the vacant state-owned Pier 48, then was pushed by tugboat back to Terminal 46. Later in the day, contractors used loading equipment to scoop dirt from the off-balance barge and load it onto another barge, Newborn said. A third barge is being brought in from across Puget Sound to handle soil when digging restarts, according to the state. Conveyor belts are used to move dirt from Bertha’s cutting face, through the rear of the cylindrical machine, and over a freight-rail trackway, to Terminal 46, where a barge awaits. As Bertha burrows north toward South Lake Union, the conveyor belt behind it is continually lengthened, and will eventually transport soil some 10,000 feet. Workers at Terminal 46 can either drop soil from the conveyor system through a chute onto a barge or onto a cordoned section of the dock. So why not keep Bertha moving by dropping dirt onto the dock? Because the dock surface at Terminal 46 still has piles of a concrete-dirt mix from last week when Bertha drilled through the concrete vault wall and grout-infused soil. STP doesn’t want to mix clean native soil with the concrete-filled material left on the dock, Newborn said. Clean dirt is hauled to a quarry near Port Ludlow, while contaminated soil is trucked to a specialized landfill. Before work was halted, Bertha had been traveling north near Main Street toward the Alaskan Way Viaduct, where it will dive beneath the old elevated highway in March. During the stoppage, STP says the cutting face is being rotated “now and then” to prevent muck from hardening against the rotary cutter, Newborn said. 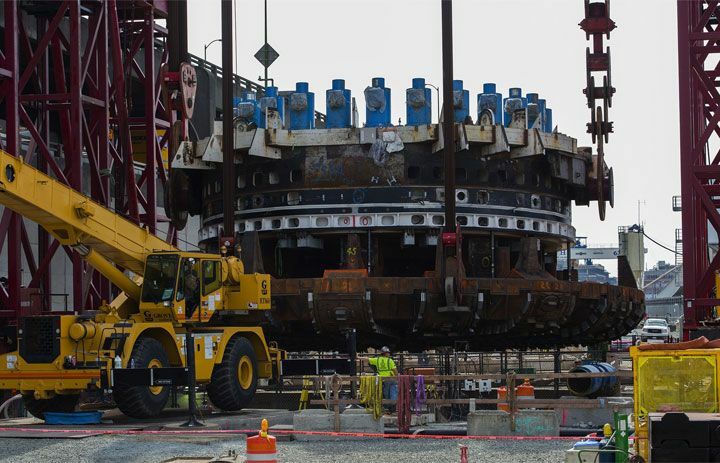 Bertha has mined more than 190 feet since Dec. 22, when the strengthened machine moved forward within the access vault. Earlier in 2015, the 4 million-pound front end was hoisted out of the vault to the surface for repairs.